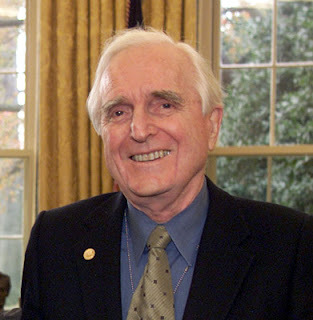 Douglas Engelbart was born on January 30, 1925 in Oregon, USA. He is the inventor of the computer mouse currently in use today. Douglas was the youngest of 3 brothers son pair Carl Louis Engelbart and Gladys Charlotte Amelia Munson Engelbart. After graduating from high school Douglas entered Oregon State University. However, in the 2nd World War, he entered the Navy and became a radar technician in the Philippines for two years. At that time, Douglas read a book that inspires him: As We May Think, Vannevar Bush's book. He then went home to Oregon State University and completed graduate courses in electrical engineering in 1948. In addition, he also completed a degree at the University of California Berkeley, and received a B. Eng in 1952, and received his Ph.D. in electrical engineering and computer science (EECS - Electrical Engineering and Computer Science) 3 years later. After completing his doctoral studies, Douglas stayed in Berkeley to teach. However, only lasted one year. Douglas then plan the company Digital Techniques. The company aims to commercialize the results of his doctoral work in the field of storage devices (storage device). However, the company was only last year and Douglas was moved to the Stanford Research Institute (SRI). At SRI, Douglas patented twelve patents on behalf of him. Douglas submitted a proposal to create a project called "Augmenting Human Intellect: A Conceptual Framwork". This project successfully received funding from the ARPA (Advanced Research Projects Agency), the U.S. government agency under the Ministry of Defense aimed at developing new technologies for military purposes. With those funds, Douglas established his own laboratory in a SRI which he named ARC (Augmentation Research Center). At that time, there have been some kind of tool that can move their pointer on the screen, such as the light pen (pen light) and the joystick. However, Engelbart was not satisfied with these tools. He tried to map the characteristics of a pointing device that has been there and seen a tool that does not exist in the map, the mouse. The discovery had been born. Douglas does not remember who gave the name of the mouse in his creation tool. What is clear, with a cable tool that extends from the back it does look like rats and everyone in the lab where Douglas worked to call the device the mouse. described as an "XY position indicator for a display system". Goods is then given the name of the mouse. Douglas developed this with his colleagues, Bill English. Bill was the one who worked on the hardware part of this mouse. Although mouse invented by Douglas, but he never received royalties from his invention. In an interview, Douglas said that "SRI has patented it, but they do not know the value of these items. A few years later they melisensikannya to Apple for 40,000 dollars. " Once submitted to the ARC leadership Bertram Raphael and ownership transferred to a company called Tymshare, and McDonnell Douglas, Douglas was retired in 1986. After his retirement, with his daughter Christian Engelbert, Douglas founded the Bootstrap Institute with funds that are not too large and organized management of three half-day seminar at Stanford University in the year 1989-2000 which apparently managed to inspire many seminar participants. Now, Mr. Douglas is Emeritus at Douglas Engelbart Institute. While her Executive Director. In 2005, Douglas received research funding from the Natioanl Science Foundation for open source project named HyperScope. On December 9, 2008, Douglas was awarded the honor at the "Mother of All Demos" to 40, activities created by SRI International. Major Douglas Engelbart less popular than Bill Gates or Steve Jobs, Douglas. In fact, both the PC (personal computer) - that uses Windows-or Apple Macintosh, use the same device is made in Douglas. Mouse was created as a byproduct of finding another, more ambitious project, augmenting human intellect, which projects to enhance human intellectual abilities with the help of a computer. In that project, considered a tool that can facilitate human interaction with computers through a tool that can move their pointer across the screen. With this tool is expected interaction between humans and computers become more natural so the computer can be used optimally to solve human problems.